"What I witnessed was the extremely positive impact the program had on my colleagues who went through it, the impact on the Department, and the way that others both inside and outside the institution viewed this opportunity." 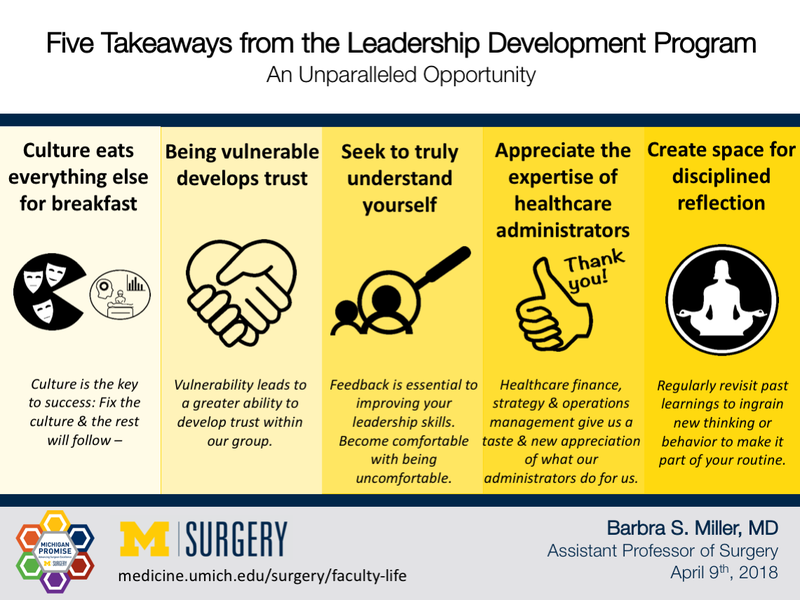 In May, 2017, thirty-one surgeons ranging from residents in their academic development years to full professors gathered at Dr. Mulholland’s house for the kick-off of the third LDP program. Previous graduates of LDP 1.0, Chris Sonnenday and Mike Englesbe (both transplant surgeons), shared their experiences and the impact this program had on their personal and professional lives. Two of us just beginning the journey, Dawn Coleman (Vascular surgery) and myself (Endocrine surgery), shared our thoughts about what we hoped to gain from the program in the coming year. Having been on faculty since 2007 and being someone who is not an ‘early adopter’ of most things (I held on to my Blackberry until our IT group stopped supporting them in 2015), I had watched with intrigue and ‘hopeful skepticism’ to see what the true experience and value of LDP 1.0 (created by Justin Dimick) would be. What I witnessed was the extremely positive impact the program had on my colleagues who went through it, the impact on the Department, and the way that others both inside and outside the institution viewed this opportunity. Now it was our turn. Culture eats everything else for breakfast. Before the program started, I imagined learning about management, finance, operations and strategy would be most important in looking forward to success in future leadership opportunities. Instead, what I learned is how important culture is to success. Take the time to fix the culture and the rest can follow. Often, optimizing business operations can be easier than fixing culture. Truly spending the time to get to know those with whom you work can be invaluable. While being asked to share several of our most personal hardships (our “core stories”) with a few of our colleagues during a session led by Bob Quinn was extremely uncomfortable for many of us, the value quickly became obvious. The ability to be vulnerable with one another is incredibly important, leads to a deeper understanding of one another and leads to a greater ability to develop trust within our group. From this new appreciation of one another, we can support one another better and achieve greater things together going forward. Seek to truly understand yourself. Know your strengths and understand your ‘blind spots’. Feedback is essential as it relates to improving your leadership skills. The higher you go the less willing people are to give you quality feedback. Become more comfortable with being uncomfortable in letting people know what you’re working on to improve yourself on a personal level and as a leader. If you need help, work with a coach. Appreciate the expertise of healthcare administrators. There are reasons MBA and Healthcare Administration programs exist as formal advanced degrees. Day-long introductions to healthcare finance, strategy and operations management gave us a taste and new appreciation of what our administrators do for us. While I can easily calculate a 50% decrease from the baseline PTH level, estimating equity growth by doing a DuPont analysis is a different story. Create space for disciplined reflection. Make time to reflect on recent events on a regular basis. Identify what you did well and where you have an opportunity for continued improvement. Regularly revisit past learnings to ingrain new thinking or behavior to make it part of your routine. Constantly seek to learn new leadership skills. Pass on to others what you have learned and help develop the next generation of leaders. 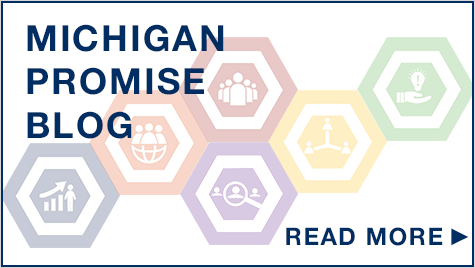 Welcome to the inaugural issue of the Michigan Promise Blog!